Unless you’ve been hiding under a pile of Krispy Kremes for the past few months, you will be fully aware that sugar has pushed fat resolutely off the “public enemy number one” pedestal, and many experts are now saying that “sugar is the new tobacco”. The World Health Organisation recently recommended that “free sugars” – those found in processed foods and honey – should make up no more than 10% of a person’s daily energy intake, and a recent BBC programme, The Truth About Sugar, revealed that these hidden sugars lurk where we least expect them. A low fat yoghurt can contain as much sugar as a large bar of chocolate. 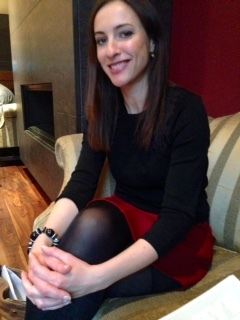 Jones, who will be familiar to viewers of the Afternoon Show on RTE, says that two thirds of her clients, whom she meets on a one-to-one basis, come to her with weight management issues and the idea for the book was born out of genuine need. “I was finding, over the years, that a lot of people would do well with the diet advice for a period of time and then, three months later, a lot of them had fallen off the wagon,” she says. “That began to frustrate me because I began to question the diet advice that I was giving. Was it actually practical enough, was it right for people? Over time, Jones identified the obstacles to success for her clients, and found that not only are we driven by our palate, which has become increasingly used to the presence of sugar in processed foods, but our head also plays a major role, and emotional eating was a recurring theme. “We all, to a degree, eat in response to our emotions; it’s how we comfort ourselves, reward ourselves or celebrate, because food is all around us,” she says. “Most of the eating that we do is not to relieve hunger, so emotional eating was a big factor for most people, as are cravings, and dealing with feelings of depravation. “I was beginning to see patterns emerge, in the sense that sugar and sweet cravings seemed to be people’s biggest obstacle. People would say they have a sweet tooth and have no willpower when it comes to sweet things; that they are addicted to sweet things and they just can’t give up. Time and time again it was the same patterns repeating themselves with people’s sugar cravings,” she says. 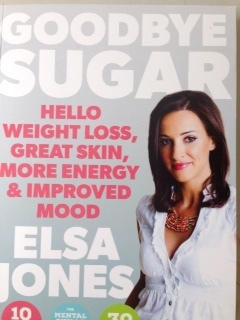 In Goodbye Sugar, which is part cookbook and part practical advice on a healthier lifestyle, she combines a sugar-free nutritional plan and the psychological tools to beat sugar addiction with simple recipes that make sticking to the maintenance plan easy. “The structure of the book is based on a two-step programme that I developed and have actually been practising with clients for quite a while on a one-to-one basis and also in group courses,” she says. “The idea is that it is a two-step approach to weight management, but the book is very specific to sugar because I felt it was a big enough issue. But really it’s about developing a really balanced moderate, controlled, relationship with all types of foods, but there is a very specific focus on sugar. “In the first part of the program we address the physical side of things. We look at rebalancing low sugar levels through dietary changes. Essentially what that does is reduce your sweet cravings and need for sugar and refined carbohydrates like the bread, scones, white pasta and suchlike. That starts what I call a 10 day sugar challenge, which essentially is a kick-start plan. The idea of the 10 day sugar challenge is it sort of wipes the slate clean and gives your body and mind a fresh start. It kind of recalibrates your system. That’s the kick start plan,” says Jones. “If I was to bet, you’ll feel so good after the 10 days, you won’t really want to go back to your old eating habits because you’ll realise your jeans are looser, you feel much clearer in your head, much more energetic and your skin looks better. When you start to see and feel the benefits, you’ll love it. Then that will inspire you to keep it up, and that’s where the balanced eating plan helps you. It bridges you onto the next phase,” she says. This may sound a bit virtuous, but before you reach for that second Krispy Kreme, Jones is keen to emphasise that her plan is not a sugar detox programme. For a book that offers so much practical advice, it is extremely readable, and it may just be the perfect read for people with good intentions who just need a gentle push. It is timely too. As the warmer weather creeps in, people automatically adapt to a lighter diet, and the prospect of a lighter weight for the summer is an incentive, or should we say, the perfect “carrot”. Essential to success is putting a good plan in place and making it easy to stick to it. “I could honestly say that for the majority of people who don’t achieve their health goals, it comes down to a lack of planning and organisation,” she says. “We all live very busy lives and I get it, I’m a working mother and it’s hard. But if you really want to achieve your goals it’s about prioritising it. So I kind of give a step by step guide: get organised, prepare your environment and plan.